Free Admission to the festival tent all weekend! 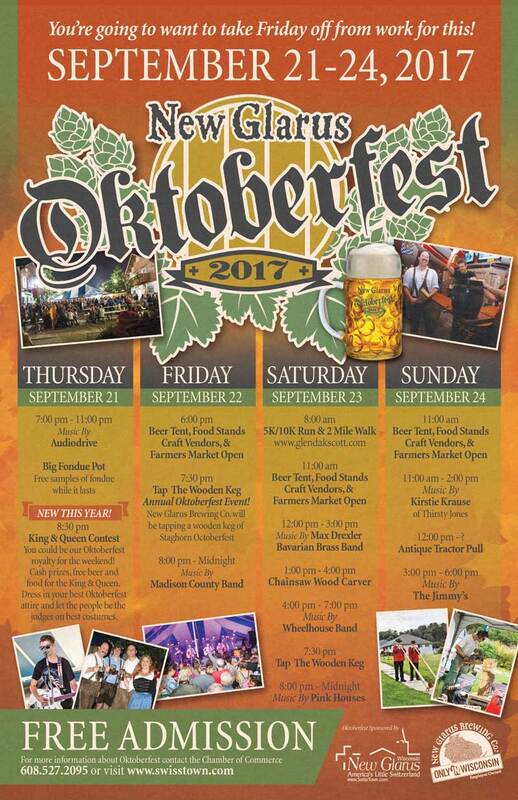 Oktoberfest presents many spirited activities and events in downtown New Glarus featuring live music, great food, wagon rides, chainsaw carving, plus plenty of family fun. Live music in festival tent all weekend! You’re going to want to take Friday off from work for this!! We are kicking off Oktoberfest one night earlier! Big Fondue Pot Free samples of fondue while it lasts. King and Queen contest at 8:30pm. You could be our Oktoberfest royalty for the weekend! Cash prizes, free beer and food for the King & Queen. Dress in your best Oktoberfest attire and let the people be the judges on best costumes. 8:00pm – Midnight Madison County Band. Hottest Country Band in Wisconsin! 3pm – 6pm The Jimmys wrap up our Oktoberfest celebration!